That was the thought that went through my head as I looked at the shelves of RPG books in my office. “Honestly how many of those do you think you are going to play? You’ve only just found the motivation to run Titansgrave”. I hate it when I’m on the receiving end of my thought process, especially when I know it’s right. My RPG collection has been growing over the years and being a devout follower of “cult of the new” it was a mishmash of systems with no real focus. If it was shiny and exciting I was drawn in like a magpie. Now I want to make a change to be more focused and I’m slap in the middle of that process. Too many systems, that’s the main problem I have with my collection. Each book has it’s own system of mechanics so I find that I’m reaching a level of mediocre when GMing. I want to see if I can get good at running a system so first on the agenda is a reduction of systems. 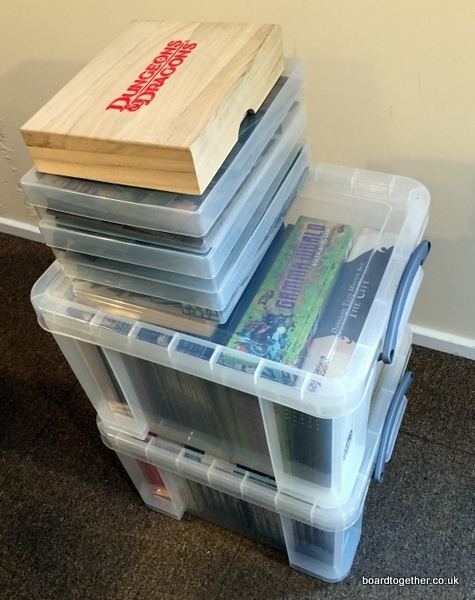 I purchased two big plastic boxes from B&Q and started to thin the number of books. If I wasn’t going to run it this year – into the box it went. If I have no interest in the world, into the box. Crappy product, into the box. Then there were the accessories for each system, and I’m not just talking about dice. Some systems are backed up with a massive line of accessories – into the boxes as well. Let’s just take a look at one system, Dungeons and Dragons 4th Edition. Miniatures, 4 boxes of map tiles, Poster Maps, Wooden Boxes with Acrylic Counters, small rules compendium, D&D dice bag… It went on and on but they all went into the boxes. 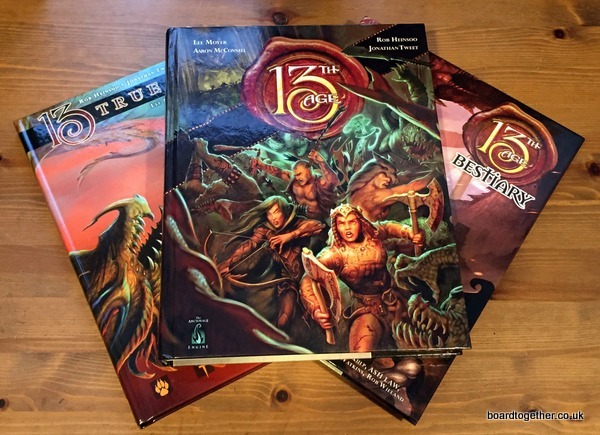 13th AGE – Really nice books that has a lot of the thought process that goes into creating a system. Often there are side notes from the authors about their preferences on mechanics and often let the GM use the one they like. The books are bound really well, the artwork is fantastic and they show the love that went into the product. 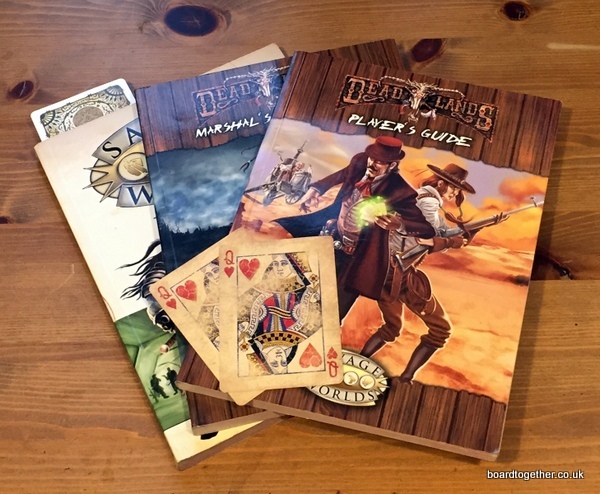 Deadlands Reloaded – I love the setting of these books (weird west) and uses the easy Savage Worlds ruleset. The plot point adventures are nice books that have a lot of back story for the world. So plans for this year? 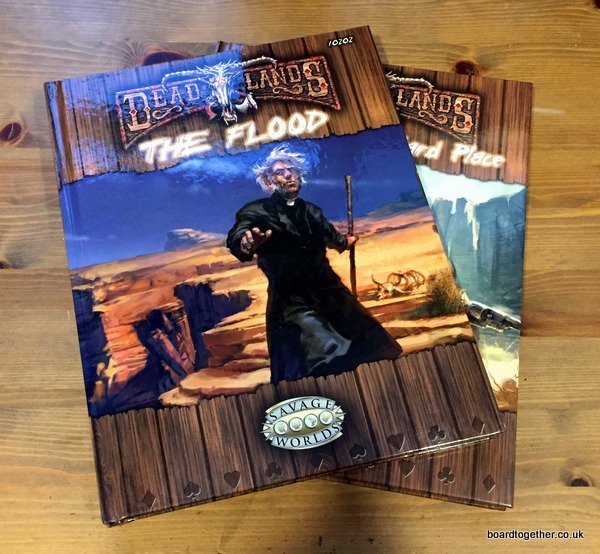 Deadlands Reloaded Plot point Adventure, The Flood will be the next system and one I plan running it for the rest of the year. Savage Worlds is a gateway to a load of different setting but Deadlands is the one for me. So that’s it, I wont need any more books for the foreseeable future as I have a plan for roleplaying the rest of the year. The other systems are going into storage and I now have just the system books I need to focus on for the rest of the year… Brilliant! Just don’t show me anything shiny!